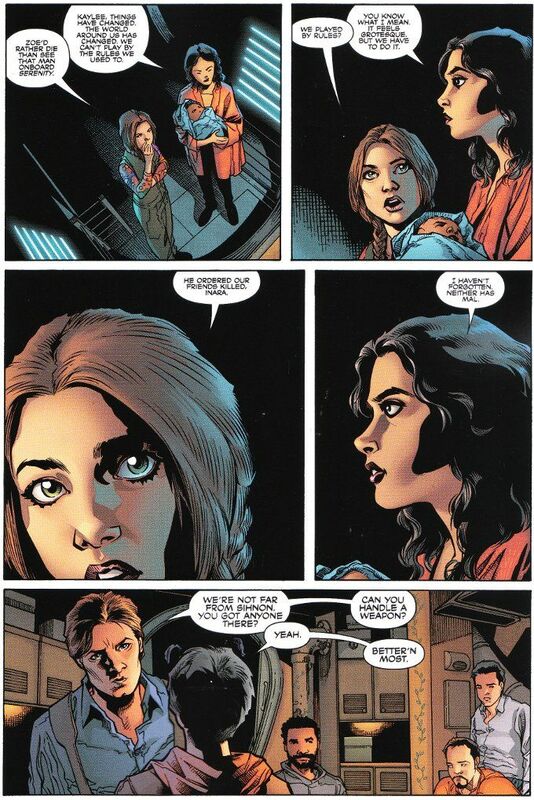 This will probably be the last issue of Serenity: Leaves On The Wind I'll be reviewing. I enjoy the book immensely but it occurs to me that there is little point in my writing about it. To speak the plain truth, this book doesn't hold much for anyone who isn't already a card-carrying Browncoat. And despite the first two issues doing a good job of playing "catch-up" for anyone who hadn't seen Firefly or Serenity already, this issue - and the previous one- haven't been as accommodating. The plot has Mal tracking down The Operative - the bad guy from Serenity - in order to secure his help in breaking into a secure Alliance facility and rescuing a dozen other psychic combat bunnies like River. Why? So they can help them break into an even more secure Alliance facility to rescue Zoe. Of course Mal's plans never run smooth and complications arise, starting with everyone else on the crew having objections to one degree or another about accepting The Operative's help. Confused? 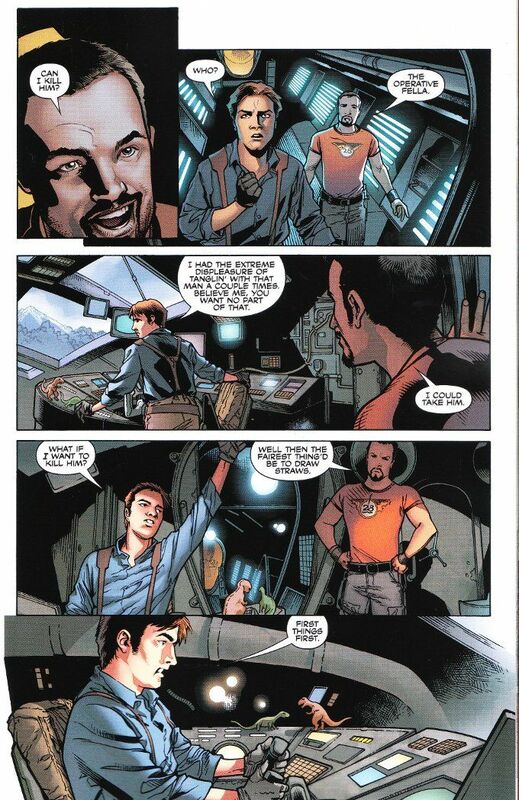 Then you're probably not a Browncoat and this comic is not aimed at you. A larger problem with this series it hat it has leaned heavily on some the more action-oriented (and, coincidentally, male) members of the crew. True, Zoe does get a fight scene in this issue but it seems to be tacked in so there's some action somewhere in this chapter. The more non-combat oriented characters - like Simon and Kaylee - aren't given much to do except stand in the background. This is marginally better than Inara, who has had nothing to do in this story but bed down with Mal and take care of Zoe's baby. Granting that she's probably the one person on the crew best equipped to handle taking care of a newborn, greater care could have been taken to make it clear that she's taken the role on because of her Companion training. I also have little to say about Georges Jeanty's artwork at this point beyond the fact that I don't like it. There's little consistency from panel to panel. Jeanty can capture an actor's likeness perfectly in one moment and then render them off-model in the next. His mid-range characters lack any definition at all, and if it weren't for such cues as skin-tone and clothing it would be hard to tell who is who in the far-shots.